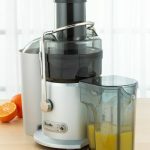 In this Breville 800CPXL Motorized Citrus Press Review I want to give you a honest review on this appliance. The Breville 800CPXL Citrus Press sports a modern look, but it has all the elements of a classic, potent citrus juicer. 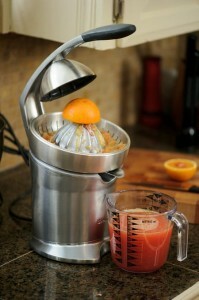 Equipped with a powerful motor, it extracts juice from citrus fruits like few other juicers can. Packed with many convenient features and safety elements, it will be a welcome addition to your kitchen counter top. The Breville 800CPXL has a one size fits all cone, so unlike other juicers, you don’t need to replace the cone if you want to juice lime, oranges or grapefruits of varying sizes. And because it is industrial strength, there’s no need to worry about the unit breaking down due to pressure or wear and tear. 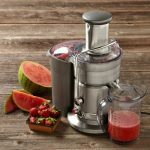 The juicer doesn’t just extract juice very well, but it also comes with two pulp filters, one for pulp free juice and the other with pulp. It also comes with a drip prevention juice sprout, so you don’t end up spilling juice all over your kitchen counter top. In addition, the juicer has an Active Safety lock so your fingers are protected from accidents. 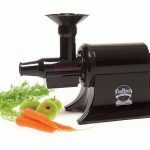 But it isn’t just in the safety features that the juicer excels, but the overall design as well. The juice pressing lever for instance, is very well positioned, and it doesn’t take a lot of pressure to extract the juice either. The lever is sensitive, so you have complete control over the amount of juice that comes out. The Breville 800CPXL is a powerful citrus press, and it has a lot going for it. The juicer is so easy to use; just place half an orange or other citrus fruit and press the lever down, and you have your juice. Most of the components are dishwasher safe. The parts are very easy to disassemble and put together, essential for easy cleaning. The 800CPXL Citrus Press runs quietly in spite of its powerful moor, so you can use the press even during the morning. The unit’s exterior is brushed stainless steel, very stylish. The interior is also made of stainless steel so it won’t get stained or discolored by acidic juices. 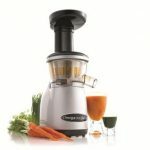 The juicer is built for long term use and has a one year warranty. While the Breville 800CPXL is solid, there are some aspects which could be better. Since its arm design is unique, it takes a while to get used to. It cannot handle very large grapefruits. Conclusion The Breville 800CPXL Citrus Press is brilliant, combining elegance and power in one solid package. It is versatile enough to handle different kinds of citrus fruits, yet easy enough for a first time user to learn quickly. Combined with its ease of use, the safety features and easy cleaning, and you have one of the best citrus juicers in the market. 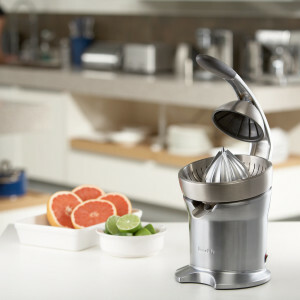 Although it is powerful, it remains a citrus juicer and not recommended for other fruits or vegetables. But if you love oranges, lemons and other citrus fruits, this is one product you cannot do without. 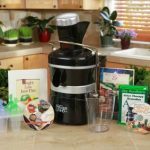 I hope this Breville 800CPXL Motorized Citrus Press Review has helped you.